- Can you imagine how special your loved one will feel when you present her with this lovely little Luckenbooth pendant? 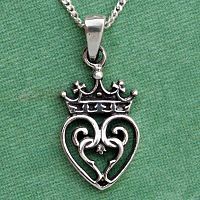 This design, with its crown and entwined hearts, is an old Scottish symbol of love and affection. 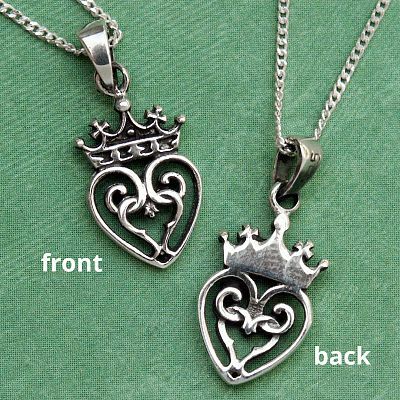 Specifically, the crown symbolized loyalty and fidelity, while the hearts, of course, represented romantic love. Our Luckenbooth Pendant is so delicate and feminine. 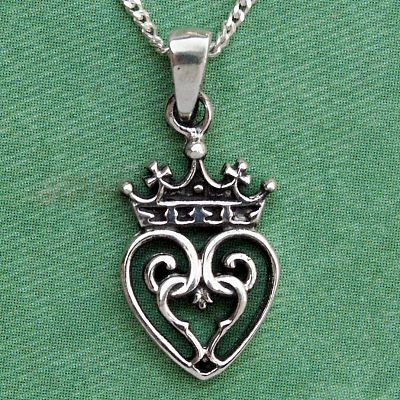 The tiny heart pendant is made of sterling silver, and is suspended from an 18" sterling silver chain. The pendant and bail together measure approximately 7/8" tall. From an unlikely source, to be sure. You see, jewelry pieces with this design were immensely popular in the 17th century especially. Enterprising craftsmen sold them from tiny booths on Edinburgh's Royal Mile. The booths were locked up tight at night, hence the name "Luckenbooth", or locked booth. Has it always been a love token? It has always been a love token first and foremost, and was often given as a betrothal gift. But it was also sometimes called a witch-brooch, and worn as a good luck charm. Children were given Luckenbooth charms to protect them from the evil eye, and to keep them from being kidnapped by the fairies. Do you have any other questions about our Silver Luckenbooth Pendant?